Normandy (French: Normandie) is a region of northern France, bordering the English Channel. Normandy is famed for the D-Day Allied invasion on June 6, 1944. Normandy consists of two regions: Basse-Normandie, the lower part, comprising the departments of Calvados, Orne and Manche, and Haute-Normandie, the upper part, comprising Eure and Seine-Maritime. Stylish renovation of wing of old farmhouse in tranquil setting near Avranches. Ideal base for famous landmarks, walking and cycling, sandy beaches, golf, fishing etc. Sleeps 2/4. 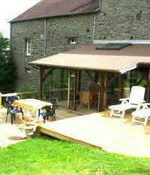 The gite was finished in 2005, and is fully self contained. 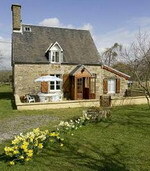 It is set in an acre and a half of Normandy country side, with small farms on all sides. However, Avranches, the major town in the area, is only 10 minutes away. Although it is ideal for 2, with the ensuite twin bedroom, two more people can be accommodated on the sofa bed downstairs and a cot and stairguard can be provided. Travel to the gite is very easy, with many options.The drive from the ferry ports of St Malo and Caen takes approximately 1 hour, and Cherbourg, Le Havre, Dieppe and Roscoff. slightly longer. The airports at Dinard and Rennes are 1 hour away. Because the French motorways are so good and uncrowded, the drive from Calais or the Eurotunnel terminal is a delight, taking about 4 hours. The fully equipped kitchen has: gas hob, microwave oven, fridge with small freezer and dishwasher. This beautiful property, nestling under a cherry tree, is a converted farm bakery with great character. 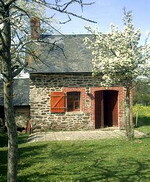 It boasts the original stone and clay oven (attached to the outside of the gite) along with many other attractive features. La Boulangerie is a country gite offering the benefits of rural peace and quiet with opportunities for walking and cycling along country lanes and walking in the nearby beech woods. It is also ideal for an activity holiday within easy travelling distance of many activities. 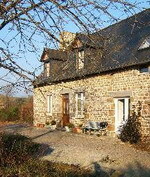 La Boulangerie is a charming ‘petit gite’ in a secluded orchard setting close to Brecey. The living area on the ground floor is an open-plan kitchen/living room and is equipped with video, DVD and CD player. The kitchen is fully equipped with electric hob, fridge and microwave oven. The bedroom is a twin bedded room. The grounds of approx 2 – 3 acres include orchards of apple, pear, peach and plum trees. There is also a barbecue and play area within the grounds. Outside the fenced grounds is beautiful countryside and there are lovely walks along country lanes. There is also an outdoor swimming pool as well as tennis courts and fishing lakes nearby. Sleeps 2.